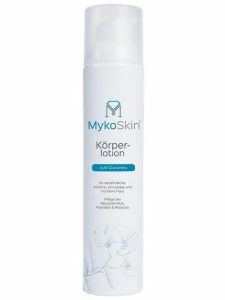 This lotion was specially developed for the daily basic care of large areas of skin. The body lotion is easy to apply, quickly absorbed and leaves the skin feeling soft and supple. The highly effective active ingredient Organic Glucaneo in combination with high-quality ingredients, such as evening primrose oil and shea butter, moisturises your skin, makes it look younger and provides it with essential fatty acids. The scent of citrus fruits rounds off the pleasant wellness care for your individual skin type. Treating dry or cracked skin areas with the body lotion’s special components, makes them soft to touch and supple again.